Thank you for visiting our website. 'Vintage Posters of Ceylon' was launched at the Galle Literary Festival in Sri Lanka on 29 January 2011. 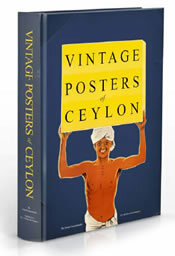 'Vintage Posters of Ceylon' contains 256 pages and measures 24 cm x 30.5 cm and weighs 2.1 kilos. There are 332 images of vintage Ceylon posters. The book is priced at US$ 80.00. If you live in a country not mentioned in the Shipping Destinations below, please send us an email with your contact details so that we could provide an exact quotation for Shipping and Handling.